Jan 26, 1924 - Feb 23, 2017 Alice Kim Armour died peacefully Feb 23, 2017 in Los Alamos, NM, at the age of 93. Alice was born Jan 26, 1924 in Kamuela, HI, on the Parker Ranch. She was one of eight children born to Kim Young Song and Park Pong Nam. She grew up in Honolulu later working for US Army Ordnance during WWII. She met her future husband Wendell G. Armour at a USO dance. 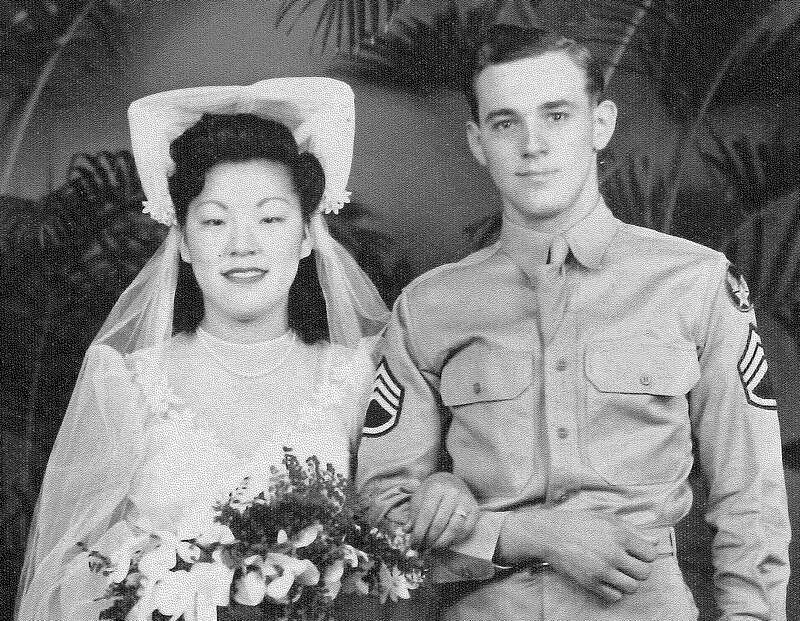 Alice and Wendell were married May 1, 1943. MSgt Armour, a decorated veteran (SS, BS, PH) of the US Army Infantry who served in WWII and the Korean War, died Jun 26, 2014 in Los Alamos, NM, at the age of 92. As a military family they moved often and were stationed in Hawaii, New Jersey, Texas, and Taiwan. Wendell retired from the Army after 22 years. He had a second career working for the federal government. Alice and Wendell then followed their children. They lived in Libertyville, ILL, Dallas and San Antonio, TX, and Albuquerque, NM, before settling in Los Alamos, NM, in 2007. Alice is survived by two children: Wayne Armour of Portland, OR, and Irene Powell of Los Alamos, NM. A third child Kendell D. Armour died in 1975. Grandchildren are Lee Powell of Washington, DC, Lauren Heerschap of Lander, WY, and Allison Armour of Portland, OR. Alice enjoyed being with people and talking about her family. Her smile and sense of humor made everyone laugh. Alice loved to read books, play bingo, and watch her favorite TV programs. She was active at her local Senior Center where she had many friends. Alice was much loved and will be missed by all. Alice and Wendell will be together forever with final interment (Military Honors) of their ashes at the National Memorial Cemetery of the Pacific (Punchbowl), HI. ALOHA OE!